The Standing Committee of the National People's Congress (NPCSC; Chinese: 全国人民代表大会常务委员会) is the permanent body of National People's Congress (NPC), both exercise the legislative power of the state. The NPCSC oversees the election of the NPC, and can extend the term of the current NPC by put off election by at most a year with a two thirds majority vote. The NPCSC convenes the NPC once a year, and may do so when it finds it necessary or with a proposal from one fifth of NPC's members. The NPCSC holds power until the succeeding NPC elects its standing committee. Members of the NPCSC must not, at the same time, hold executive, judicial positions. In contrast, members of the NPC does not have such restriction. The NPCSC has the power to interpret the laws of the PRC, including its constitution. In contrast to other countries in which stare decisis gives the power of both final interpretation and adjudication to a supreme court, within Mainland China constitutional and legal interpretation is considered to be a legislative activity rather than a judicial one, and the functions are split so that the NPCSC provides legal interpretations while the Supreme People's Court actually decides cases. Because an interpretation of the NPCSC is legislative in nature and not judicial, it does not affect cases which have already been decided. A notable use of the constitutional interpretation power occurred in 1999 over the Right of Abode issue in the Hong Kong Special Administrative Region in Lau Kong Yung v. Director of Immigration. The NPCSC interpreted the Basic Law of Hong Kong in accordance with the position taken by the Hong Kong government with respect to the eligibility of permanent residency in Hong Kong. It is led by a Chairman, Mainland China's top legislator, who is conventionally ranked third in Mainland China's political ranking system, after the General Secretary of the Communist Party of China and the Premier of the People's Republic of China. The current Chairman is Li Zhanshu. Li Zhanshu (b. August 1950): 3rd-ranked member of the Politburo Standing Committee of the 19th Central Committee of the Communist Party of China (CCCPC). Wang Chen (b. December 1950): member of the 19th Politburo, member of the 16th, 17th, and 18th CCCPCs, and former deputy head of CCCPC Publicity Department. Cao Jianming (b. September 1955): member of the 17th, 18th, and 19th CCCPCs, alternate member of the 16th CCCPC, and former Procurator-General of the Supreme People’s Procuratorate. Zhang Chunxian (b. May 1953): member of the 18th Politburo, member of the 16th to 19th CCCPCs, and former secretary of the CPC Xinjiang Uyghur Autonomous Region Committee and Hunan Provincial Committee. Shen Yueyue (female, b. January 1957): member of the 17th, 18th, and 19th CCCPCs; the former executive deputy head of the CCCPC Organization Department. Ji Bingxuan (b. November 1951): member of the 17th, 18th, and 19th CCCPCs; the former secretary of the CPC Heilongjiang Provincial Committee, and the former chairman of the Standing Committee of the Heilongjiang Provincial People's Congress. Arken Imirbaki (Uygur, b. September 1953): member of the 19th CCCPC; chairman of the Standing Committee of the Xinjiang Uygur Autonomous Regional People's Congress. Wan Exiang (b. May 1956): Vice President of the Supreme People's Court (since 2002); chairman of the Central Committee of the Revolutionary Committee of the Chinese Kuomintang (since 2012). Chen Zhu (b. August 1953): hematologist; academician of the Chinese Academy of Sciences; Central Committee chairman, Chinese Peasants and Workers Democratic Party (since 2012). Wang Dongming (b. July 1956): standing committee member of the 10th Chinese People's Political Consultative Conference (CPPCC), a member of the 17th, 18th, and 19th Central Committees CCCPCs; the secretary of the CPC Sichuan Provincial Committee, and the chairman of the Standing Committee of the Sichuan Provincial People's Congress. Padma Choling (Tibetan, b. October 1952): member of the 18th CCCPC; the former chairman of the Standing Committee of the Tibet Autonomous Region People's Congress, and the Chairman of the Tibet Autonomous Region. Ding Zhongli (b. January 1957): geologist; vice-president of the Chinese Academy of Sciences. Hao Mingjin (b. December 1956): the former Vice-Minister of the Ministry of Supervision. Cai Dafeng (b. June 1960): chairperson of the China Association for Promoting Democracy. Wu Weihua (b. September 1956): chairperson of the Jiusan Society. For a more comprehensive list, see List of current standing members of the National People's Congress. 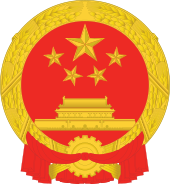 ^ a b c "The National People's Congress of the People's Republic of China". www.npc.gov.cn. Retrieved 2019-04-19. ^ "FACV Nos 10 and 11 of 1999". Judiciary of Hong Kong. 3 December 1999. Retrieved 11 March 2016. Presidium of the Supreme Soviet, a Soviet Union institution, after which Standing Committee of the NPC was modelled. This page was last edited on 19 April 2019, at 20:40 (UTC).